Our tasting group included two Provençal producers: Julian Faulkner (Canadian) of le Grand Cros and Stephen Cronk (English) of Domaine le Mirabeau; Robin Goldstein, American wine economist and journalist; Geoffrey Doyen (French), co-founder of digital sommelier program wineta.com; Jacopo Fanciulli (Italian) Master of Wine student, wine and food PR consultant; Ben Bernheim, a member of the University of Edinburgh wine tasting team and me. 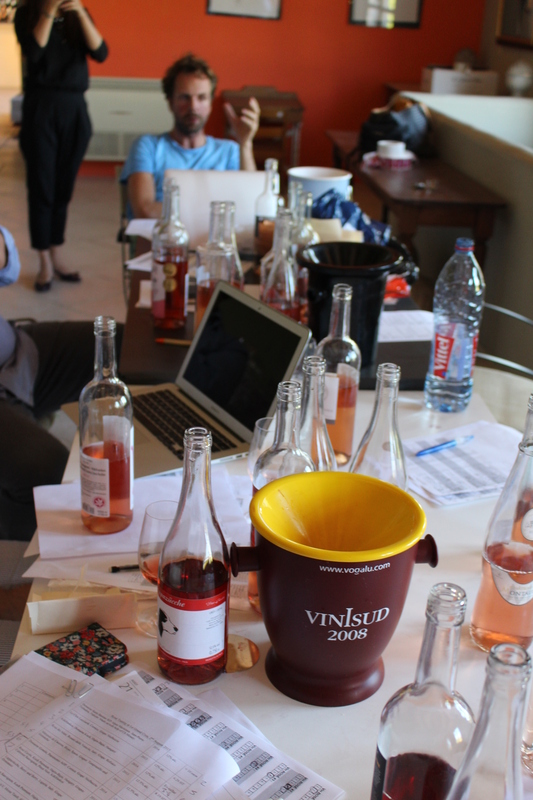 Our results showed that the rosés did not have to be young, pale or dry (i.e. Provence-style) to be appreciated, although when very dark-almost red there was some hesitation. Good fruit, structure, balance were appreciated, even for rosés very different from the classical Provence standard. 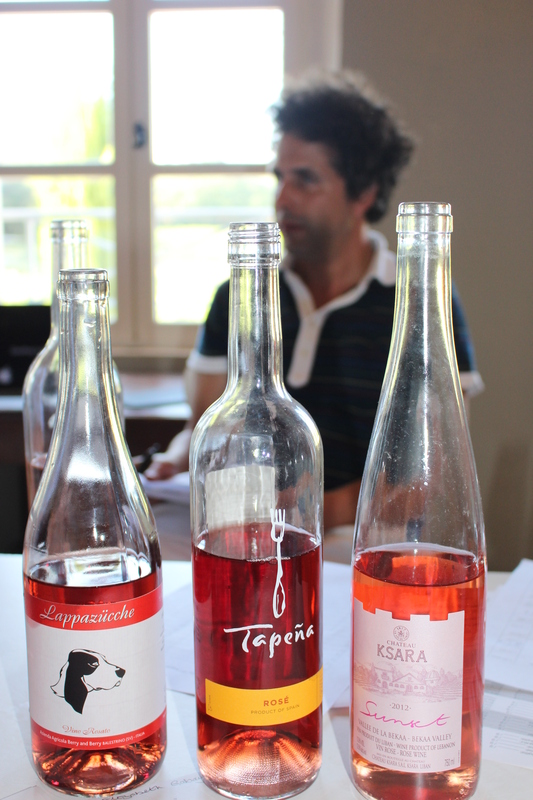 Jacopo was particularly impressed with the Hungarian rosés. As Hungary is not normally associated with rosé wine production, this suggests a communication opportunity for Hungarian rosé. In general, regional characters were not apparent. The wines were made from many varieties: Niellucciu, Kékfrankos, Tempranillo, Barbarossa, Cabernet Sauvignon, Cabernet Franc, Pinot Noir, Grenache, Cinsault, Mourvedre, Syrah, Refosco. Styles varied, but it was impossible to tell whether variety or wine making was responsible for the different quality levels. 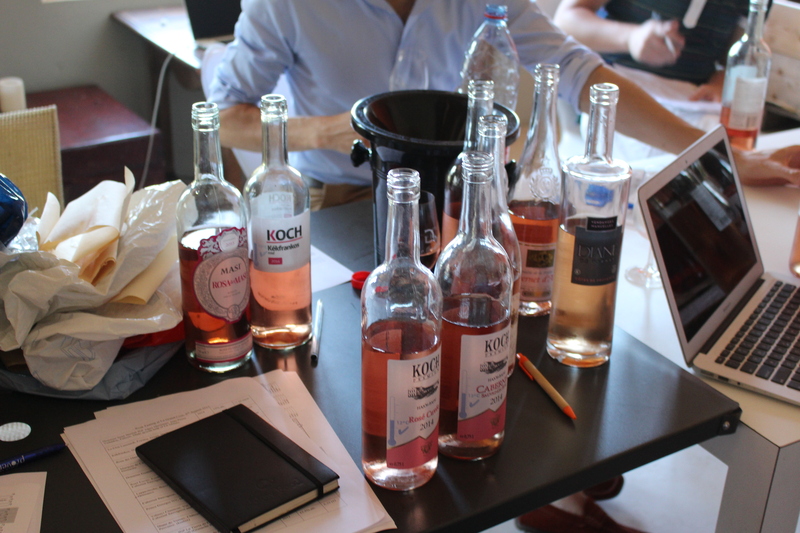 Several tasters gave high scores to the Kékfrankos rosé, suggesting this is a good variety for rosé. I have doubts over some Cabernet-based rosés, where, in the attempt to retain acidity, too much of its leafy, vegetal character is retained; for these a fine balance is needed. From Hungary, Koch’s Cuvée (Cabernet Sauvignon, Pinot Noir and Kékfrankos) and his Cabernet Sauvignon rosé showed that, when ripe, Cabernet-based rosés can be very attractive. The Cuvée had a lovely fresh floral fruit character, the Cabernet Sauvignon was fresh and leafy but not green. Julian liked the use of different varieties to create differing styles. As he noted, Cabernet Sauvignon and Carignan are never dominant varieties in Provençal rosés, so could maybe be used to produce interesting styles. This was particularly interesting because it reflected the different grape variety as well as the style of wine-making. Berry & Berry’s Lappazücche from Liguria, made with an old local variety Barbarossa, combined vibrant fresh red fruit, with dry minerality and crisp acidity, well-balanced with fruit charm, earning high scores from four tasters. The Rosa dei Masi made with Refosco had vibrant cherry fruit and crisp acidity. The two Corsican wines, Domaine Gentile and Clos Lucciardi, both made with Nielluccio, were dry with red fruit and a dry herby finish. Colours of the rosés ranged from dark cherry pink to the pale Provence rosés. The difference is more apparent when looking at the full bottles, but as these were bagged before tasting, in the glass the colour was less obvious and generally looked paler. Though we tried to avoid the colour influencing our judgement, it was difficult not to see the darkest rosés as red wine. The Tapeña and the Rosa dei Masi — both a dark cherry pink — may well have lost marks because they were so dark as to be almost a pale red, although Jacopo noted that the intensity of colour bore little relation to the quality of the wine. 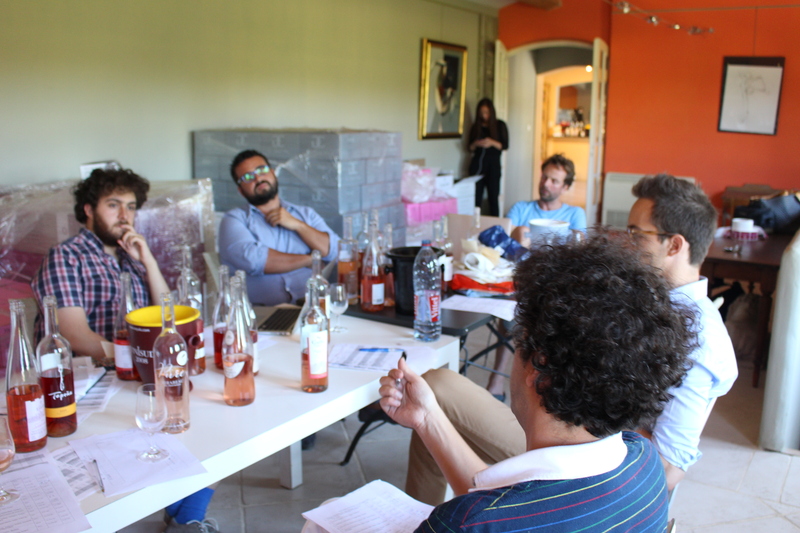 The other tasters agreed, remarking that ‘pale’ was more a regional character (of Provençal rosés) than an indication of taste. ‘Structural’ rosés may be more weighty and/or savoury in character, hence more suited for drinking with a meal and maybe moving into the ‘gastronomic’ style. This does not mean they are not good drunk on their own, but that they have more weight, less floral character. The rosés of Grand Cros and Mirabeau had good weight, balance and structure, clearly defined red fruit and fresh, mouth-watering acidity. While I think they would not be termed ‘structural’ in a line-up of Provençal rosés, in comparison to some of the other wines in this tasting, they combined greater weight with fruit and acidity. Marques de Caceres, Rioja 2013 (Tempranillo and Grenache) and Koch’s Kékfrankos had this similar combination of being dry with good fruit and fresh acidity, backed by weight and structure. These four wines were popular, receiving high scores from several tasters. With so much press stating that rosés have to be drunk young and fresh, often within the summer of bottling, it was good to taste older rosés, some dating back to 2011, still drinking well. The age of the wines tasted was the factor causing the biggest divergence in scores. Some tasters loved the unusual tastes of the more mature rosés. Others found them more difficult to appreciate. The Tapeña 2011 had marks ranging from 3 to 9 and the Sunset Château Ksara 2012 from 2 to 8. The high marks for aged rosés from some tasters suggests that these appeal to some, and so — even if the market may not be large — may represent a useful market niche. This led to us to consider what makes the best aged rosé. Often, rosés are shown to potential consumers and buyers when too young (February to April in the northern hemisphere) while they are simple and full of boiled fruit character. Perhaps some should be tasted later, when they may take on more interesting character if allowed to age a little. As none of the rosés were evidently barrel-aged, we thought it would be interesting to taste some at a future tasting and look more closely at rosé wine’s ageing potential. Gallo’s Grenache 2013 with 9.5% alcohol and some residual sugar, was popular. Though everyone admitted that this was a style we would not think of buying, we all agreed that the extra touch of residual sugar, if not too sweet and if well balanced by acidity and fruit, makes an attractive style of rosé. Slightly less successful, but still popular, was the off-dry, fruity kosher wine ‘Prince George’ NV from Coteaux Narbonne. The least successful amongst the sweeter wines was the Domaine de la Petite Roche, Cabernet d’Anjou demi-sec with 10.5% alcohol, which I found leafy, with hints of elderflower and sweet, but which was more popular with the other tasters. Our general appreciation of rosés with some residual sugar was a surprise, and suggested a future tasting for rosés with higher residual sugar ranging from wines which appeared dry and fruity to sweet wines, sweet pink muscats and fortified pink wines. The kosher wines we found unremarkable. Domaine Saint Bastian 2014, Jean-Pierre Tichadou, Falicon, IGP Alpes-Maritimes 12% alc. Prince Georges NV, Moise Taieb, IGP Coteaux de Narbonne 13% alc. Diane de Vernay NV, Château Montaud (Moise Taieb), Côtes de Provence. (kosher) 12% alc. Chateau Montaud 2014, Côtes de Provence. (kosher) 12.5% alc. Domaine de la Petite Roch 2014, Cabernet d’Anjou demi-sec. (kosher) 10.5% alc. Domaine Le Grand Cros 2014, Côtes de Provence. (Grenache and Syrah) 13% alc. Mirabeau Pure, Domaine le Mirabeau 2014, Côtes de Provence. (Syrah and Grenache) 13% alc. Le Clos Lucciardi 2013, Corsica. (Niellucciu) 12% alc. Domaine Gentile 2014, Patrimonio AOP, Corsica. (Niellucciu) 12.5% alc. Kékfrankos 2014, Domaine Koch, Hajós-Bajai, Hungary 12% alc. Cuvée 2014, Koch Premium, Hajós-Bajai, Hungary. (Cabernet Sauvignon, Pinot Noir, Kékfrankos) 12% alc. Cabernet Sauvignon 2014, Koch Premium, Hajós-Bajai. Hungary 13% alc. Villányi Classicus 2014, Vin Art-Koch, Villány, Hungary. (Cabernet Sauvignon, Kékfrankos) 12.5% alc. Rosa dei Masi 2013, Rosato delle Venezie, Italy. (Refosco) 12.5% alc. Lappazücche 2014, Berry and Berry, Liguria, Italy. (Barbarossa) 12.5% alc. Tapeña 2011, IGP La Tierra de Castilla, Mallorca. (Garnacha & Monastrell/Grenache & Mourvedre) 12.5% alc. Marqués de Cáceres 2013, Rioja, Spain. (Tempranillo and Grenache) 12.5% alc. Sunset 2012, Chateau Ksara, Bekaa Valley, Lebanon. (Cabernet Franc and Syrah) 13.5% alc. Grenache 2013, Gallo Family Vineyards, California, USA 9.5% alc. The more good rose wine there is the better off the world will be.